The evening of Friday, October 21, 2016 Pam and I attended the Nebraska Methodist College Reunion Dinner at the DC Center. 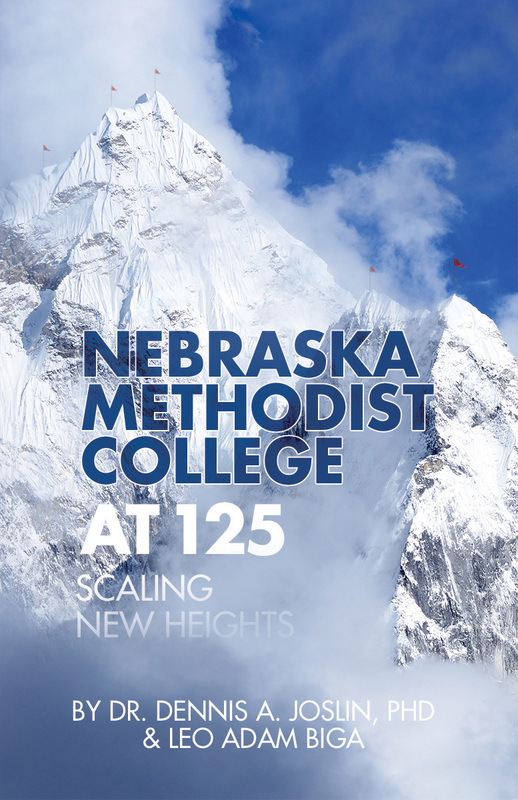 It was my great honor to accept NMCs Honorary Alumnus Award in recognition of my work on the college’s just published history book “Nebraska Methodist College at 125: Scaling New Heights.” I co-authored the book with NMC President and CEO Dennis Joslin. It was a great project to be a part of and I am most grateful to everyone who contributed to it. Thst growing nursing and allied health college celebrates 125 years in 2016. NMC is known for its caring culture and I can attest to the fact that it is a community of warm, welcoming, nurturing faculty and staff deeply committed to educating, growing and mentoring health professionals. I came to the project with no healthcare or educational background and everyone I interacted with for the book went out of their way to make me feel at home and to catch me up to speed. That the college thought enough of my efforts to give me their highest award tells you something about how they practice mindfulness. The video that Peter Soby produced on me for the award presentation was very well done. The comments that Dennis Joslin made in introducing me were flattering. The whole evening was beautifully put together by Alumni Engagement Director Angela Heesacker Smith. Thanks to NMC marketing pros Elizabeth Billington and Marc Costanzo for their expert work on the book and for the great book display they set up in the lobby. The entire alumni reunion dinner felt like a family reunion. Indeed, I am told that an NMC Honory Alum is automatically a part of the college’s family for life. I am thrilled to have been adopted by this loving family and I look forward to many more reunions to come. It is the history of this highly respected and fast growing private college of nursing and allied heatlh located in Omaha. The book was written by NMC president and CEO Dennis Joslin and myself. We are proud to have told the story of the school’s remarkable ascent in a hardbound volume that we hope appeals not only to NMC alums, faculty, staff and donors but to the wider Methodist and Nebraska healthcare community as well. You know, it’s a funny thing about writing. There was a time when I could never have imagined myself writing books – this despite the fact that for many years I was one of the principal practitioners of long form journalism in this town. As I have come to find out, if you can write a compelling narrative in a 4000 to 6000 word newspaper or magazine article, then it’s really not much of a stretch to do the same in a 75,000 to 100,000 word manuscript. Book projects are an increasing part of my writing life and career. The book projects I have done thus far have come to me in a variety of ways. I have colleague David Bristow to thank for recommending me to NMC for what became “Nebraska Methodist College at 125.” Some of my other books came as a result of journalism assignments I did. I have a new edition of the Alexander Payne book out right now. If there is a nonfiction book you want written about yourself, your family, your business, your creative work, then drop me a line here or via email at leo32158@cox.net or by calling 402-445-4666.